Rabbi Yaakov Meir Schechter (born 1932) lives in Jerusalem and is a prominent and respected leader and teacher in Israel, particularly in the hasidic Breslov movement. He is a well-known kabbalist and rosh yeshiva of the Shaar Hashamayim Yeshiva for Kabbalah in the Mekor Baruch neighborhood, as well as at the main Breslov Yeshiva in the Meah Shearim neighborhood. Rabbi Yaakov Meir Shechter was born in the Old City of Jerusalem to Rabbi Dovid Schechter, a prominent member of the Breslov community. Growing up in the Old City, Rabbi Shechter studied under the elders of the previous generation, particularly under the famed Breslover Rabbi Abraham Sternhartz, who had immigrated to Israel from Uman, Ukraine in 1936. During the 1948 Arab-Israeli War, the Schechter family was expelled from the Old City by the Jordanian army along with the entire Jewish population of the Old City. They resettled in the Katamon neighborhood of Jerusalem and later moved to the Meah Shearim neighborhood. Rabbi Schechter lives an ascetic lifestyle and is regarded by many as a truly holy man. Thousands of people worldwide, of all backgrounds, flock to him for his blessing and guidance on all matters. He is widely regarded as one of the great contemporary leaders of the Breslov movement. His lectures and writings, which draw from a broad range of sources, from Talmud and Midrash to Mussar, Chassidus and Kabbalah, guides people on the path of service of G-d and self-perfection. Rabbi Schechter emphasizes the application of Chassidic, Mussar,and Kabbalah teachings to the challenges of life and the pursuit of spiritual growth. Rabbi Schechter has been a passionate supporter of Rabbi Meir Baal Haneis Salant charity and gives of his precious time freely to assist Rabbi Meir Baal Haneis whenever called upon. Jews worldwide fervently pray for the continued health and welfare of Rabbi Yaakov Meir Shecter. 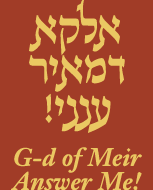 May G-d give him strength to carry on with his holy task of study, prayer, and guiding Jews in their spiritual quest for self improvement and drawing closer to G-d.